The top nine seeds are all in the Round of 16 at Roland Garros, though some matches were much easier than others. Djokovic, Nadal, and Murray all got through very comfortably but Roger Federer needed 4 sets to advance. Tomas Berdych was down two sets to one against South African Kevin Anderson before rallying to win 6-4 in the 5th. 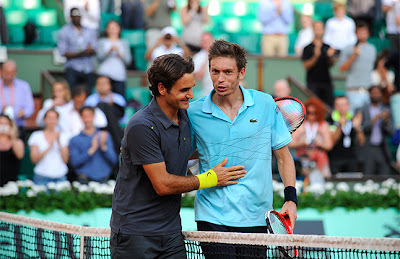 Federer played a good match against Nicolas Mahut, winning 63 46 62 75 in over two and a half hours. Many think that Roger was off his game and he should have won in straight sets. I agree he probably should have won in straight sets but disagree with those that say he didn't play well. 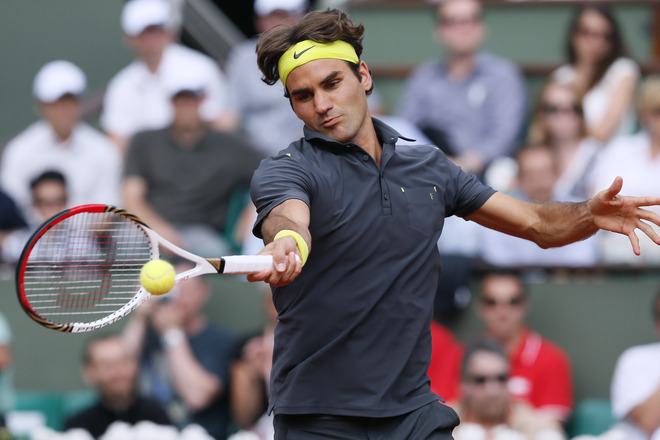 The Maestro hit 54 winners to 25 unforced errors, and with Roger's attacking game, those are superb numbers. Adding to that, only 7 of those 54 winners were aces, so he was doing very well from the baseline. To his credit, Mahut played as well as he could have. He is a tricky player to go up against because of his serve and volley tactics, but he also has a decent ground game, as Roger found out. He was also pushed by the French crowd, particularly towards the end of the match when it looked like he may be able to push the match towards 5 sets. Warm embrace at the net. Massive respect for each other. Next up for Roger is lucky loser David Goffin. The Belgian upset Lukasz Kubot in straight sets. He has done remarkably well to make it to the 4th round, but it very much looks like this is the end of his run. He has never played this many matches before and having to go up against Roger Federer, a determined Roger Federer who wants to raise his level of play, is likely the hardest thing to do for a very young player. At best, I see Goffin losing a 6-4 set. He will surely have some crowd support. - Novak Djokovic eased by 32 year-old Nicolas Devilder, a left-hander from France who has had a tough go of his career. The #1 player won 61 62 62. I did not watch the match, but he hit 34 winners and 28 unforced errors. How he could hit 3 more errors than Roger did in such a simple (and short) match is beyond me. He now plays Andreas Seppi in the 4th round, who upset Fernando Verdasco in 5 sets. - Rafael Nadal continued his simple march towards the final with a straightforward 61 63 64 win over Argentinian Eduardo Schwank. Schwank is a good doubles player now and was never really a good singles player, but he actually played about as well as he could have. Against Rafa on clay though, that didn't mean much. - Andy Murray had a much easier time of it in his 3rd round match than he did in his 2nd round contest as he thoroughly beat Santiago Giraldo of Colombia 63 64 64. Andy's back looked fine and he appeared to be in fine form heading into the second week. He will face Richard Gasquet in the Round of 16, who took out Tommy Haas in 4 sets. Gasquet beat Murray in Rome so it will be a good match. - Juan Monaco got by Milos Raonic in 5 sets, 67(5) 63 67(5) 63 64. Monaco played very well and Raonic did not break the Argentine's serve the entire match, and in the end, it cost him dearly. Raonic would have been a tough opponent for Rafa with his big serve and calm demeanor but it was not to be. - Stan Wawrinka upset Gilles Simon in 5 sets, 75 67(5) 67(3) 63 62. Stan played as well as I have seen him play in a very long time. The match lasted over four hours and Stan hit 82 winners. His backhand was firing on all cylinders, showing why it's one of the best shots in the game. - Jo-Wilfried Tsonga, Janko Tipsarevic, Juan Martin del Potro, Nicolas Almagro, and David Ferrer all swept into the 4th round with straight sets victories. All four players look really strong at the moment. (3) Federer vs Goffin: Roger should take this match in straights without much trouble. I expect him to up his level of play, as he said he wanted to do. Goffin will put up a nice effort but in the end the overpowering play of Fed will be way too much for him. (1) Djokovic vs (22) Seppi: The Italian is a talented player but is really no match for Novak in mid-Slam form. I believe Nole could play at 60% of his ability and get by in straights. (2) Nadal vs (13) Monaco: Monaco will put up a fight and give everything he's got, but it will not amount to anything in the end. He lost 61 62 62 in the Davis Cup final last year and while I don't expect the scoreline to be that lopsided, Rafa should get through with ease. (4) Murray vs (17) Gasquet: This is an interesting match that could likely go either way, although in 5 sets Murray should get through if he doesn't implode (or get injured). Gasquet won in Rome but that was 3 sets, and 5 sets is an entirely different ball game. (5) Tsonga vs (18) Wawrinka: These two met last year in the 3rd round and Stan won in 5. However, after the 5-setter the Swiss just had to endure, Jo will be the fresher player and should win. Stan should take a set though. (5) Ferrer vs (20) Granollers: Ferrer. End of. (7) Berdych vs (9) del Potro: Delpo came off a straight sets win while Tomas is coming off a tough 5-setter. This one is a toss up and will likely come down to a few points. Delpo has the head-to-head advantage, but Berdych is the better player right now. Somehow, I think Delpo wins this one. (8) Tipsarevic vs (12) Almagro: This is a match that I could see going either way, but in the end I think Almagro will win. He is a better clay courter and I think he has the edge. It will be close either way, probably going 5 or 4 tight sets. It should be a great second week at Roland Garros!